It’s no secret that we love national parks. 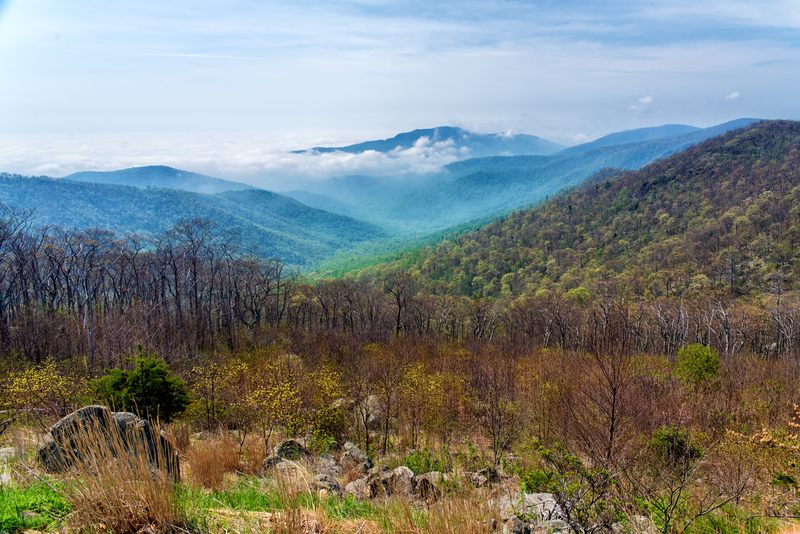 So when I realized how close we were going to be to Shenandoah National Park, we knew we wanted to visit. After we left Richmond, we had an easy 2-hour drive to the Big Meadows campground, and we arrived on a Sunday. Even though it was early May, spring has not yet quite arrived at the higher elevations of this park. In fact most of the trees were still quite bare! The campground is nice and spacious and we picked a huge, pull-through site on the F-loop. There are no hook-ups at this campground, and also zero cell service. However if we walked over to the amphitheater, we were able to get enough signal to check our messages a couple times a day. As we were setting up, I happened to look out the window and noticed an Airstream parked right behind us. And then much to my surprise, I realized I recognized that Airstream! It belongs to one of my very favorite bloggers, Jackson and Kat of Life on The Blue Highways. I knew they were in the area but had no idea that they were in Shenandoah. I went running right over and introduced myself. If you haven’t read their blog, be sure to check it out. Jackson is an excellent writer and never fails to make me laugh with his witty observations. 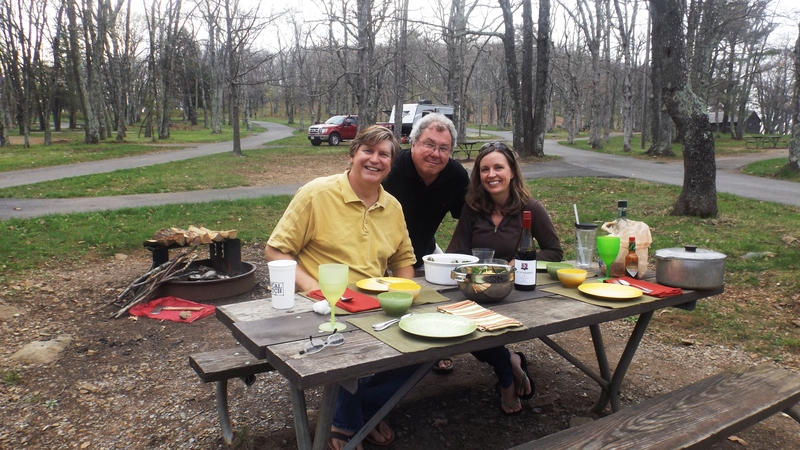 We had dinner with them one night and thoroughly enjoyed Jackson’s potato soup and Kat’s bread pudding. I neglected to bring my camera but Kat snapped a picture which I borrowed from their blog. The main road that runs through the park is called Skyline Drive, and we drove most of it and stopped at several of the scenic pull outs. The weather was nice and cool, but rather overcast and there were clouds down in the valley almost every day. One of the nice things about Shenandoah is that dogs are allowed on most of the trails, unlike most national parks. There are several waterfalls in the park, as well as a portion of the famous Appalachian Trail. But I must admit, overall Deas and I felt a little underwhelmed by this park itself. It may just be because we lived in the north Georgia mountains for 5 years, and this park felt very much like what we essentially had in our back yard. Also I think we hit it a little too early in the season. I would imagine this park must be gorgeous in the fall though. And an update to the whole bug bite/infection drama…just when I thought I was out of the woods, I woke up one morning in Shenandoah covered head to toe in a rash! So off we went to yet another doctor, who concluded that I was having an allergic reaction to one of the antibiotics I was on. A couple of days on steroids and antihistamines and then I was once again on the mend. And now that really better be the last of that story! It was sooo much fun meeting you guys and the pups. We are hoping to meet again down the road. Yes I’m still so happy we ran into you! Safe travels and I look forward to meeting up again someday! Your photos are gorgeous, love the clouds in the valley! We too, are hitting Colorado a little early, but the best part is fewer people in the campgrounds! I hope this is the last of your bug bite woes! Thanks! Yes, no crowds was a definite perk to being there early in the season. 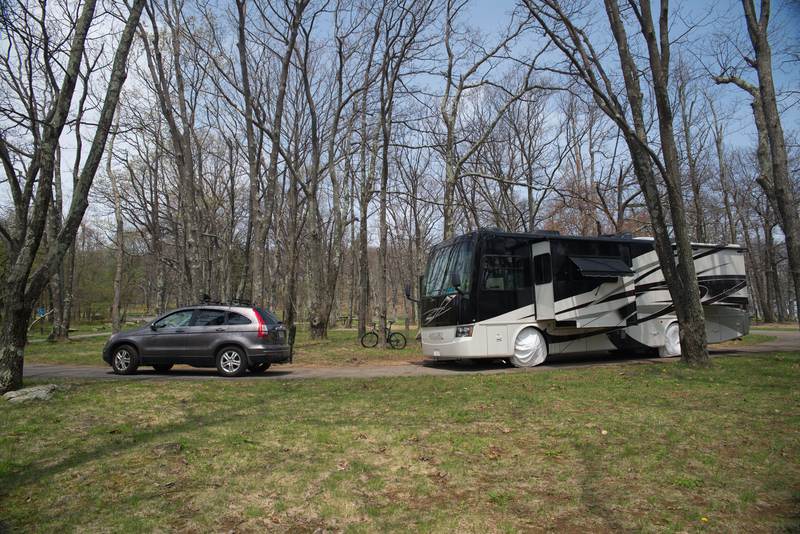 We had the campground practically to ourselves….until Friday that is, when the masses rolled in. Luckily we left on Saturday! 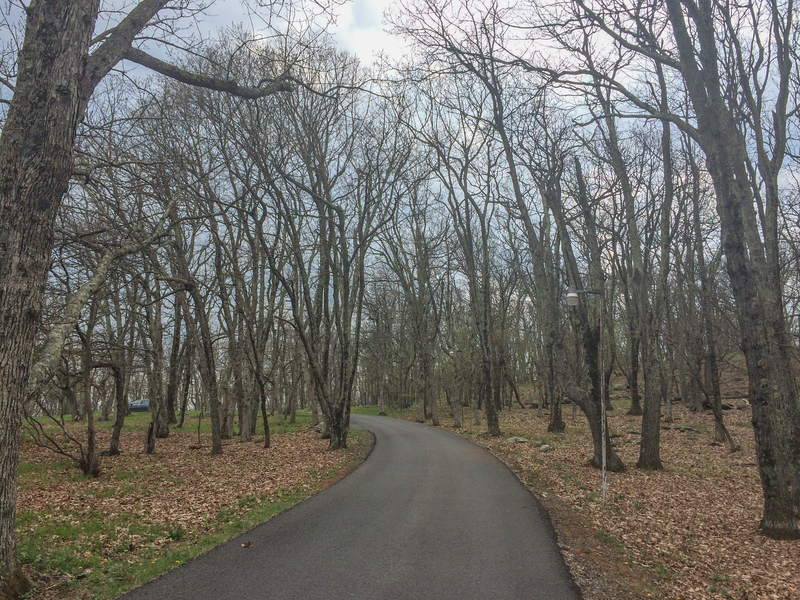 We were underwhelmed with Shenandoah N.P. too. HOWEVER wineries in this part of VA are FABULOUS!!! We came hoe with over 2 cases from 5 different wineries. Just sayin’! I’ve heard the wineries are pretty good in that area but we didn’t get to visit any! The Skyline Drive is actually the best part of the area. And, yes, fall is the time to visit. We use to take weekend motorcycle trips down the drive. The trees are always beautiful but it is sooo crowded!! You can usually see wildlife along the road since the speed limit is so low. Well one nice thing about being there early in the season was that it wasn’t crowded at all! Except for the weekend, but by then we were ready to leave anyway. We may try to swing through again on our way back in the fall. And the only wildlife we saw was a lot of deer! Forgot to mention how neat your header photos is:) You may have had low clouds but they made for the coolest photos! And thanks! Yep, clouds in a valley usually do make for good photos! We drove through last fall and it was quite spectacular. What I wouldn’t give for some cool mountain air…it is in the high 80’s here. Glad your rash cleared up. You sure none of your ailments are contagious? Not entirely sure, but I’ll be sure to give you a big whole hug as soon as I see you to test it out. Despite the lack of leaves, your photos sure are gorgeous! Love the fog in the valley. It’s funny because we are only about 2.5 hours south of there this week, and all the leaves are out. Must be an elevation thing. Glad you got to hang out with Jackson and Kat. Thanks! By the way I heard they opened up the tunnel already so ignore what I said earlier! Love seeing my home on other people’s blogs! And yea… you totally have to go back in the fall. Spring and winter do NOT do it justice! I’ve been at the beach for 6 months and although I love it, I’m surprised at how much I miss those mountains!